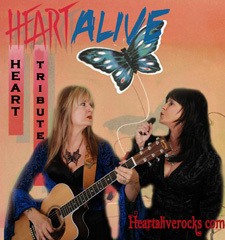 HEART ALIVE is the nation's most authentic tribute to the legendary rock band Heart, performing hits from their Dreamboat Annie album to Desire Walks On. HEART ALIVE was awarded "Best Tribute 2011" by Vegas Rocks Magazine--sharing the award stage with artists such as Sebastian Bach, Vince Neil, and Steve Stevens. Capturing Ann Wilson's power, range and pitch perfect vocals is Valerie James, Heart Alive's "Ann Wilson"...with Julie Torchin on guitar and vocals as "Nancy Wilson". Both women are huge fans of Heart and have poured their passion into their performance. HEART ALIVE'S seasoned musicians Dave Davis (lead guitar/vocals), Brad Torchin (lead guitar/vocals), Todd Rogers (keys/vocals), Aaron Olson (drums) and Danny Buss (bass) have come together to touch hearts of all ages--bringing back memories and sounds that defined a generation. No other Heart tribute captures the note-for-note signature sound, performance and feel of a Heart show than the members of HEART ALIVE. HEART ALIVE'S mission is to bring to the stage everything a Heart fan wants to experience. We focus on every detail--from dead on guitar solos to solid harmonies to costumes and stage presence. "We want our audience to know that we love this music just as much as they do, so it is imperative that we put all our energy into our performance each time we step on stage". HEART ALIVE is a national tribute show, performing festivals, showrooms and corporate events all year round. HEART ALIVE was one of 12 tributes in the country chosen to perform the prestigious New Year's Eve at Fremont street's "TributePalooza3". The band continues to sell out showrooms across the nation. Charlie Kayle from KOIT Radio Morning Show in San Francisco has praised HEART ALIVE as being "Not just the best Heart Tribute, but one of the best tribute shows out there today - absolute 'top shelf!" The members of Heart Alive also perform a national tribute to Fleetwood Mac (Fleetwood Nicks) and both shows can be combined for an incredible classic rock experience! See our Contact Page for more details!